I am so glad that you still use the Car Stand. Buggy looks AWESOME!!! That looks great! Cool colors. 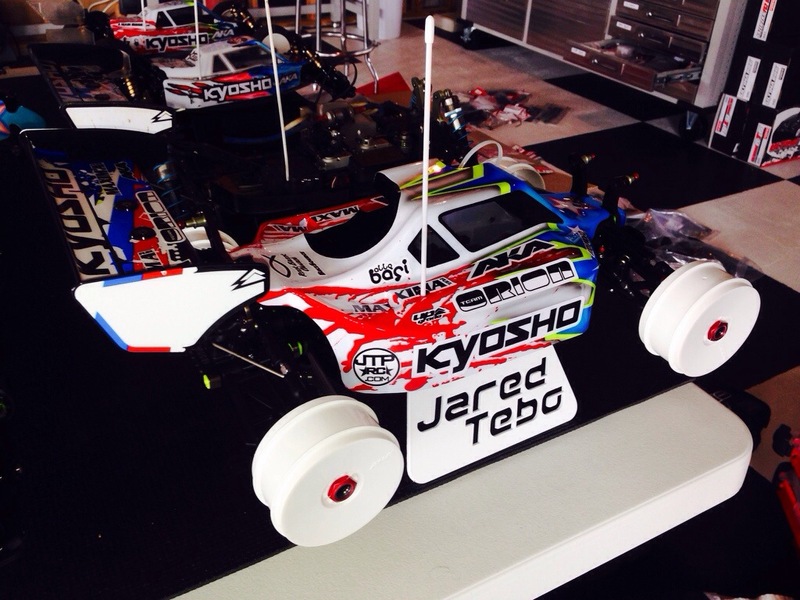 Makes me wanna buy another kyosho! This white wheel madness cannot stand! Honestly, I thought the white wheels looked better. So glad your going back to them. Don’t worry I agree too. Not enough yellow to justify yellow wheels. Car looks goods with some yellow, but the white wheels are spot on. Nice, love that dripping blood effect with the red! Where do you get the small fish sticker you always have on your cars? Best of luck at the Dirt. Lord Bless you and your family. p.s. I work at a Gospel Rescue Mission, and next time I have to preach I was hoping to show the video of your testimony, before my sermon,is that cool with you? Hey Jared, what shell is that on your MP9. It doesn’t look like the IFB006 or the Bittydesign Force? It is the MP9e TKI3 body. It really fits great, has much more room for the filter and pipe, and I feel it handles really good too. I was never really a big fan of our cab forward body. Jared, are you using your setups from last year at this race as a starting point? Pretty close to my normal base setup. Last year my buggy setup was a little different. if you have a basic start set up for this type of track, i am would really appreciate, bwt i love kyo but they are too expensive in long term, my 4wd is the last standing so give a hand to my eldery.